Measures 4.5" H x 4" L. Made of solid brass Attractive, functional piece.Shell Design. A definite eye-catcher handcrafted beautiful hand emboss finish You can't miss this bell. 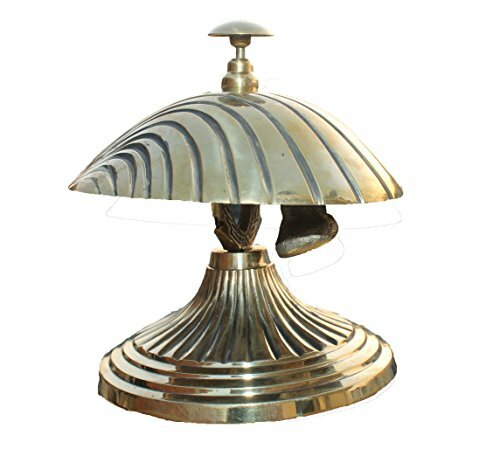 Handcrafted Service Desk Bell Hotel Counter Bell Ornate Solid Brass Hotel Counter Bell Officer call bell Hand Made in india. Push down with your palm or one finger to make it ringing ,not too much power, the bell's ringing is very loud, clear but not driving you nuts, You can get other's attention. Works well on Hotels, Schools, Restaurants, Reception Areas, Hospitals, Warehouses, Stores; Ideal for the elderly or people who are bed ridden to Ask for Help, Lunch Bell to call kids, Training Pets, great tool for kids to Play Games or Pay Attention to Teachers. If you have any questions about this product by PARIJAT HANDICRAFT, contact us by completing and submitting the form below. If you are looking for a specif part number, please include it with your message.